One thing that really delights me about this new world of Running (when, that is, I can rejoin it) is the sharing of my enthusiasm. If an old slouch like me, who took virtually no exercise for 44 years, can achieve nearly 5 miles in a non-stop run, a BP of 118 over 80, and a 21 lb (variable!) weight loss, then anybody can. I have only just started really – running for about 30–40 mins with fab fast songs on my iPod! Not far – about 1.5 pathetic little miles I should think. Still – I feel SO much better for it and can see how it MIGHT get addictive but not quite there yet as always seem to procrastinate about getting myself out of the door! SO – I checked out fetcheveryone and you are right – it’s FANTASTIC to be able to plot route – can you believe that - BRILL – and – you are right x 2 because discover my route is just under 4m and not 1.5 as thought – am superSTAR!! I did my first 5K on Saturday. 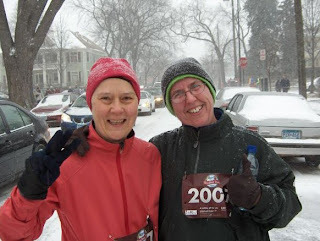 It was called the Reindeer Run and it was around Lake Harriet and the temperature was 9F with a stiff wind off the almost frozen lake and the beginning of a 5" snowfall. Luckily, we finished in 38 minutes so the snow wasn't deep enough to shovel at that point but it got steadily worse all day. But I earned my first running t-shirt and I feel good about that! Honestly - and we worry about a bit of rain in England. Ladies - I salute you. I'll be back with you as soon as I can!